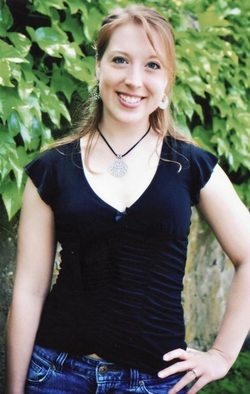 Jamie is a graduate of Westminster Choir College, a music conservatory in Princeton, NJ. She holds a bachelors degree in Music Education and Voice. She has been teaching private voice lessons and musical theater classes for the past 7 years. She taught classes for The Children's Theater of Maine, Stages, The Portland Players, and at local schools. Jamie is currently the Vocal and General Music Instructor at Memorial and Mahoney Middle Schools in South Portland. Some of her favorite performing experiences has been touring the US as a part of The Royal Christmas Tour starring Andrea Bocelli and singing in PBS's "Great Performances"- Candide in Concert starring Kristen Chenoweth. Locally Jamie has performed with The Portland Players, Lyric Music Theater, Boothbay Playhouse, The Children's Theater, and City Theater. Jamie knows her experiences/education in singing, dancing, acting, and performing will create some really fun classes for young artists to find their inner creativity. Gabrielle Royal has had a lifelong passion for classical ballet, with 20 years of training at the Libitzki School of Dance in Ellsworth, Maine and 10 years of assistant teaching ballet and tap classes for young children. She also danced at the college level, delving into choreography and ultimately acting as Senior Captain of the Salve Regina University Dance Company in Newport, Rhode Island. Joe has been acting, directing, and performing in several genres of acting over the last 25 years. His passion for performing arts shows in his work and through his instruction. While he his best known as an actor in the Portland area, he has also been involved in teaching performance art to kids and adults alike. Included in his experience is directing the teen program for the Belfast Maskers, teaching at The Portland Players for the fall student fund raiser, and teaching mime and accents at Stages Performing Arts Academy For Kids. Joe received many accolades in his Portland area main stage directing debut as he directed A Few Good Men in March of 2012. You may have seen him on stage as Frank Gilbreth in Cheaper By The Dozen and many other roles with The Portland Players as well as the Freeport Players, Belfast Maskers, Yikes!Monsters, and Lyric Music Theater. His passion is teaching theater from the ground up, so to speak and strives to foster a love for theater in anyone that joins our classes.